2014 has seen Wireless festival ditch Yahoo, drop Stratford and trek to Finsbury Park. As somebody who experienced Wireless at Stratford in 2013, I can attest that not having to mount an expedition through the Westfield shopping centre and a long stretch of endless walkways to reach a festival site means I’m wholeheartedly behind the move. A hot Sunday afternoon of Wirelessing entailed a mix of Sean Paul, Salt-N-Pepa, Elli Goulding, a dash of prosecco, drag queens in bin liner dresses and a Naughty Boy – all mere pre-gaming for impending Outkast and Bruno Mars slots. Opening strong with crowd-pleaser ‘Bombs Over Baghdad’, Outkast bounded through picks from 2000 album Stankonia, building to their UK breakthrough track ‘Ms Jackson’, a song born for a live audience thanks to that all-important “ooo” chorus hook. The sky gently opened, mirroring the rain-splattered video that accompanied the single and bringing a new meaning to backing up your music in the cloud (sorry). The drizzle relented just in time for ‘Hey Ya’ and the arrival of a giggly line-up of partying ladies on stage, coaxed up to shake it like a Polaroid picture. Mostly they just wobbled around and giggled, all particularly underwhelming considering there were three members of Little Mix up there – approximately 67% of their day job entails shaking it; I guess everyone deserves a break on a Sunday. Neither André 300 nor Big Boi raised the dance standards on display, but their energy and enthusiasm certainly hasn’t dimmed with time: they interspersed raps with press-ups, bounded around the stage and through their back catalogue, then re-asserted their founding mission statement: “Outkast is still an important word to us. We don’t do this for white people, black people, gay people, purple people or pink people. We do it for the whole world.” So there you have it: we’re all outcasts as far as Outkast are concerned, so none of us are outcasts, which is a bit of a stretch but quite nice to hear when you’re being drizzled on. Fuzzy-warm feelings notwithstanding, the Atlanta duo didn’t deliver the kind of showmanship that a festival-closing slot demands and so, despite being approximately one fifth the size of Outkast, Bruno Mars stepped into the breach. He may as well have moonwalked on, given how much he pilfers from Jacko: the fedora, black leather loafers and smooth dance tics were all there, along with a cover of ‘Rock With You’. There’s no doubting Michael Jackson’s immense contribution to the male pop singer template, but when acts like Mars, Usher or Justin Timberlake pay ‘tribute’ to him by aping his dance moves I lose interest somewhat. In Bruno’s case, this aspect to his performances is thankfully overshadowed by buckets of charisma. Every up-tempo moment was delivered like a cheeky wink and a knowing dollop of fun, his all-male band happy to join in, perhaps by lining up at the front of the stage for some sychronised gyrating – Mars makes gyrating look a hell of a lot more enjoyable than MJ ever did. 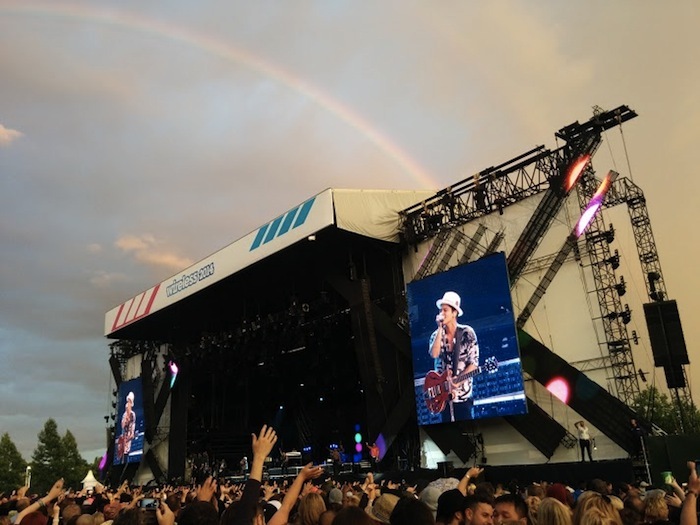 As is pretty much mandatory for a festival slot, Bruno Mars left no hit unturned, at which point you realise just what a ballad factory this man is. Luckily, there was also a helping of Led Zeppelin, a blast of Bell Biv Devoe’s ‘Poison’ and some ‘90s-tastic Montell Jordan, as Mars explained that he used to perform covers at KOKO “before making it”. Personally I was there for these high energy moments and judging by the fact that ‘Locked Out of Heaven’ closed the set, so were the majority of the crowd. There were fireworks, massive disco balls, hefty drum-kit theatrics, more gyrating, the works. Wireless clearly knows that Mars is your man for a festival climax. Check out our review of this year's Bestival and - dare we say it - get in the mood for summer 2015!